Review – Binary Code by D.H. Sidebottom and Rebecca Sherwin – 5 Stars!!! The code Harley must crack, proves to be a challenge. A mysterious man, however, manages to unravel more of the code, a surprise to them both. When the code is cracked more chaos and danger is uncovered, leading to both their lives being in danger. Binary code is a masterpiece. This collaboration between Rebecca Sherwin and D.H. Sidebottom is pure brilliance. They work hand in hand together and their words flow perfectly. It was clear their minds were in sync when they wrote this and their dark, twisted, brilliant minds, had the same journey in mind for their characters to follow. This story holds so many surprises. I found myself completely absorbed into the story; almost as if I was living the events right along with the characters. 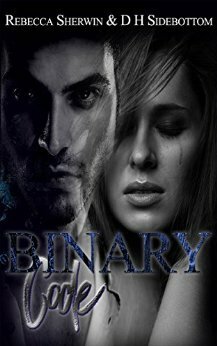 Binary Code is intense, thrilling, dark, twisted and heart wrenching. Some of the flashbacks described within this book had my blood boiling in anger and my heart aching for the pain they suffered. Harley is a strong, intelligent woman whose life was torn away from her in an instant. She is determined to rebuild her life and in doing so she must find retribution for the pain, suffering and loss she has endured. Carter is a mysterious, strong, and deadly man. He holds secrets that will not only surprise you, they will shock you to your very core. He holds no remorse for the assignments he undertakes. Although Carter is a professional, arrogant man, he is also charismatically, irresistible. I was completely captivated by their story and was sad to see it end. The ending is not what I expected; it both surprised and astounded me. I highly recommend Binary Code for those looking for a suspenseful, thrilling, dark read, with revelations that will sucker punch you in the face.